For many years, Thekla has been home to one of Banksy's earlist works in his hometown of Bristol - the Grim Reaper in a rowing boat - painted directly onto the ship's hull. During the Thekla's renovation work in the summer of 2014, the deterioration of the work was noted and the difficult decision to remove the piece was taken so that the piece could be preserved before it was lost forever. We have arranged to loan the artwork on a long term basis to the City's M Shed museum, just across the water from the club. The Grim Reaper is currently being assessed for his conservation needs and means of display before going on public show at M Shed some weeks or months later, free of charge. 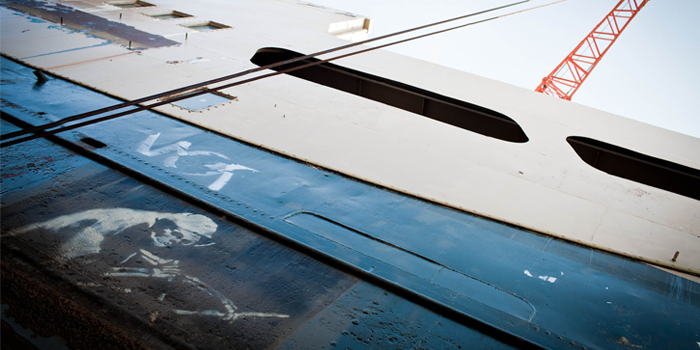 Following the removal of the Banksy, the Thekla team decided to continue supporting street art and have designated the replacement plating on the ship's hull as an exhibition space for some of our favourite artists. Every few months we will invite an artist to come and paint a new piece onto the panel, situated on the side of our iconic music venue and club facing south, operating as a rolling exhibition. 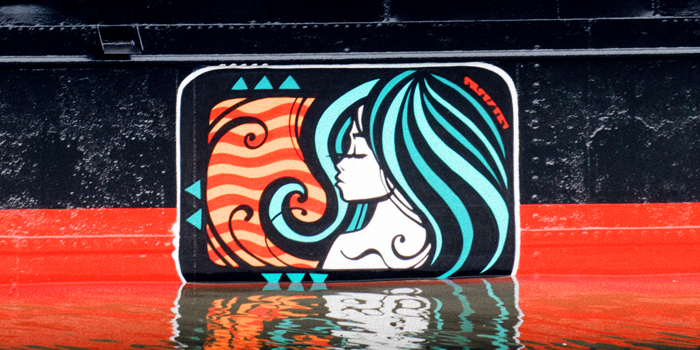 The first artist to grace the Thekla’s hull is Inkie - one of Bristol’s original graffiti artists, now based in London, he was responsible for curating the hugely successful “See No Evil” exhibition on Nelson Street in Central Bristol, and you can now find his work all over the world. The work was completed in dry dock at Albion Dockyard, Bristol Harbour on Wednesday 3rd September.